Show your customers that you care about their health and fitness by giving away this promotional exercise band imprinted with your company logo. 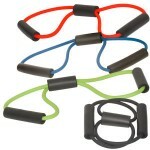 It’s portable, easy to use and easy to get in shape with. Everyone is sure to love this great gift.